On June 18, 1965 the Archangel returned. People had not done what he had told. Now the bowl of God’s wrath overflew. Saint Michael: “Priests, bishops and cardinals are heading for ruin in large numbers, and they attract still more souls with them”. God emphasized the message of his Angel with a sign in the stars. On September 18, 1965, the Japanese astronomers Ikeya and Seki discovered a new comet, that was named after them, close to the head of the hydra, the watersnake. In ancient mythology, Herakles defeated this 9-headed monster, but every time he cut off a head, a vast stream of blood came up from which new heads grew. Thus the wounds had to be cauterized. When he reached the last head, Hera sent him a lobster to byte him. Armoured with these figures and names of the star constellations, we can still see in the sky the hydra with her last head and above that the lobster. The figure below shows the orbit of the comet Ikeya-Seki. In the lobster (Cancer) we also see the star heap Preasepe (crib). 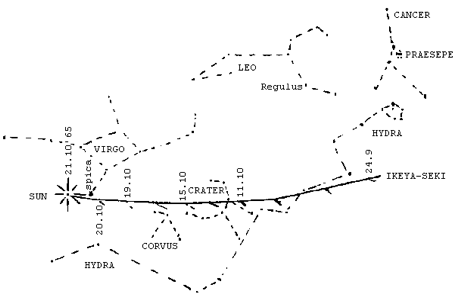 The comet was discovered near the head of the Hydra (watersnake), went through the cup and along the Raven, passed Spica and fell into pieces near the sun on Thursday, October 21, at about 3.50 world time. The Latin name for the cup is crater, the big mixing vessel. The hydra appears in Don Bosco’s great, prophetic dream of January 5, 1870. In his message for the supreme shepherd: “If you cannot proceed don’t give up but persist until the head of the hydra of error has been crushed”. It seems that in 1965 the child of the crib used the lobster’s leg to crush hydra’s head. In the blood bath the new comet appeared and took the blood as it were to the cup. There he resided on October 12, so exactly 4 years after the people in Garabandal had viewed the red star with the long tail. From then on the comet symbolizes that the cup overflows from hydra blood, which is as it were poured out upon the sun. There the comet falls into pieces so that it did not return to the Raven as astronomers had expected. This happening in the stars was one of the reasons that we wrote on 19 (20) January 1966 a warning letter to the seven bishops of the Netherlands. A few days later there was the terrible message that bishop Bekkers had a brain tumor. The Latin name of lobster is cancer, and this also means cancer. Krebs say the Germans. In the unfortunate head was everything as it were sketched in a living human being. Mgr Bekkers died in Tilburg on May 9, 1966. I had not even in the least thought of my first diocese when I wrote the letter. This entry was posted on December 17, 2014 at 1:24 am and is filed under Uncategorized. You can follow any responses to this entry through the RSS 2.0 feed. You can leave a response, or trackback from your own site.